The Xi is also rather quiet and it best of all, it doesn’t squeak nearly as much as my old Inspiron used to. My overall impression is that the build quality seems to be very good. Like most things high tech it has it’s quirks and downsides but overall I’d say it’s a damn fine piece of technology. Fujitsu Siemens is a name generally associated with solid, reliable and somewhat unspectacular PCs. This release, we suspect, is going to do nothing to change the company's functional image. It may not be thrilling, but the Amilo Xi1546 is a decent laptop. 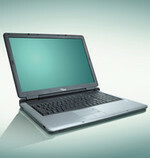 A mid-range T2400 mobile processor from Intel provides the power. Teamed up with 1GB of DDR RAM, it helped the Fujitsu-Siemens to a respectable score of 95 in our WorldBench 5 test suite. The specification of the Amilo is very decent and it's well put together. This unremarkable laptop will get on quietly without a fuss, like all good PCs should, leaving you to concentrate on your work or entertainment. It's fairly priced, too. ATI Mobility Radeon X1800: The ATI Mobility Radeon X1800 is a reduced version of the X1800XT with still a high current consumption. Non demanding games should be playable with these graphics cards. » Further information can be found in our Comparison of Mobile Graphics Cards and the corresponding Benchmark List.